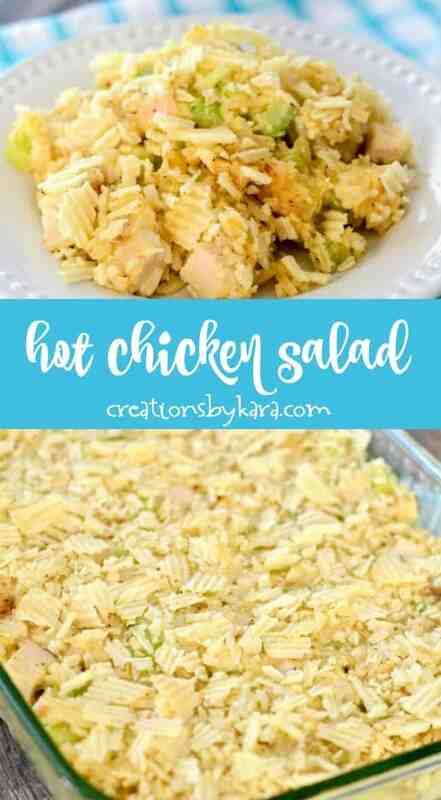 Hot Chicken Salad is an easy casserole made with simple ingredients like rice, celery, and cream of chicken soup. Almonds and potato chips give it a tasty crunch! I like to serve this chicken casserole with tossed green salad, sweet cooked carrots, and fruit salad. It’s an easy dinner that can be made ahead of time. A good friend brought this chicken dish to a luncheon years ago, and I made sure I got the recipe from her. I then proceeded to forget about it. I stumbled on it a few weeks ago, and I am so glad I made it! 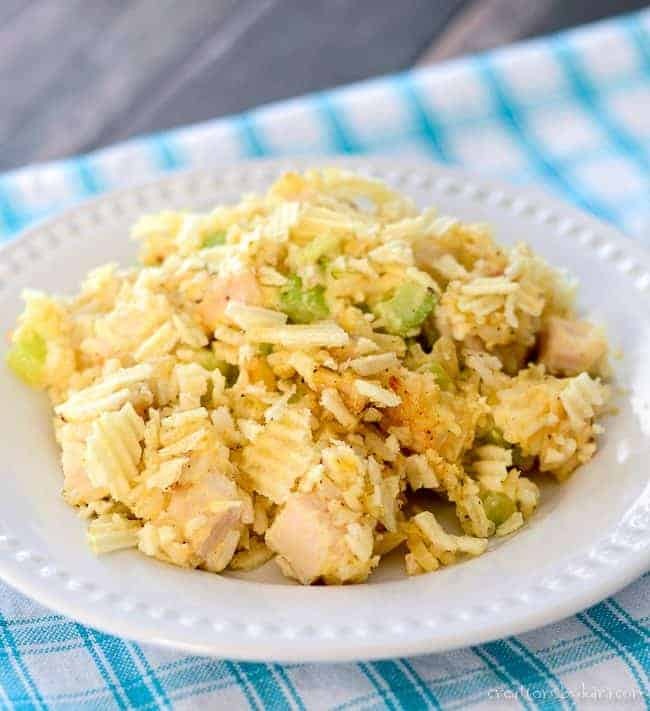 It is so simple to toss together, especially if you have leftover rice. You can even throw it together the night before, then refrigerate. Just add the potato chips right before baking. Perfect for busy nights! Cream of chicken soup and mayonnaise make this dish creamy, but celery and almonds give it a nice crunch. Potato chips on top add the perfect touch. I accidentally cooked mine longer than the recommended time, and I actually liked it that the edges got a little crunchy. But it will be a little more creamy if you stick with 25 minutes. Can I substitute ingredients in my hot chicken salad? 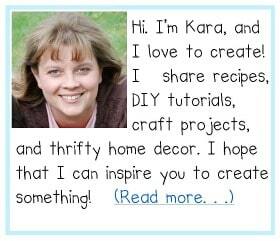 -Absolutely, this recipe is very versatile. -You can use brown rice or even wild rice. -You could add cheese to the filling. It’s common to add a little cheddar cheese, but feel free to use whatever cheese your family likes. -If you don’t have potato chips, you can use crushed up crackers, croutons, or even dry stuffing mix on top. -You can substitute pecans or cashews for the almonds, or leave out the nuts entirely. -If your family doesn’t like celery, you can substitute green peas, or leave them out. The possibilities are pretty endless. If you give it a try and change things up a little, I’d love to know how it turns out! 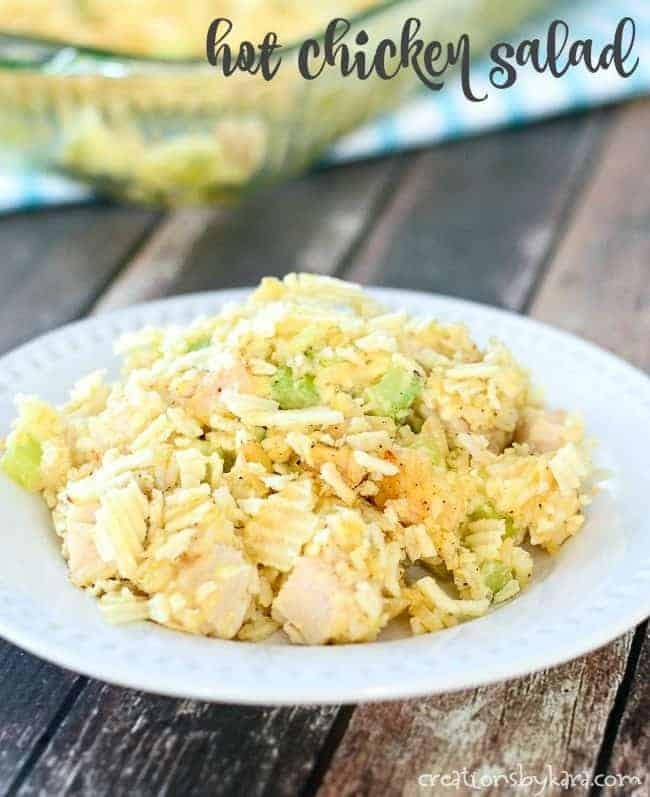 If you’re looking for an easy chicken dinner the whole family will love, give this a try! 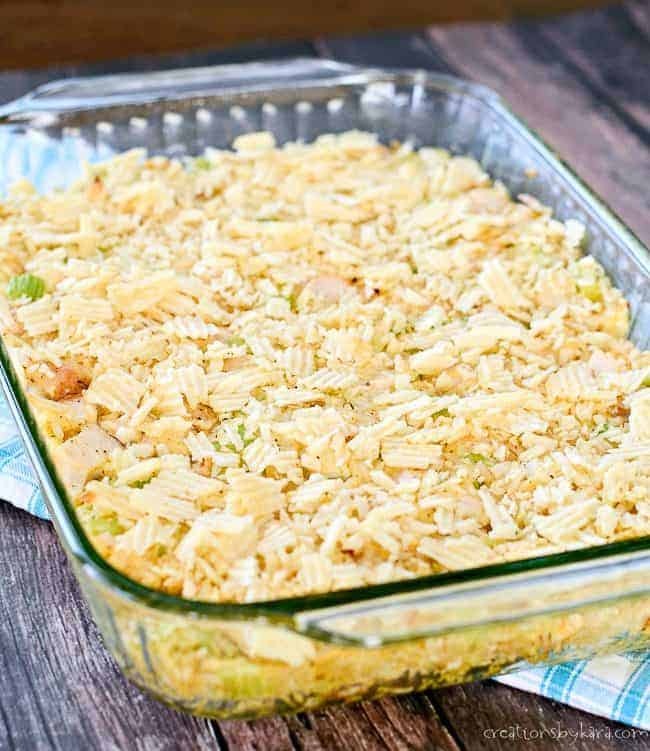 Creamy chicken and rice casserole topped with crunchy potato chips. Combine all ingredients but potato chips in a large mixing bowl. Spread into a greased 9x13" pan. Top with crushed potato chips. Bake uncovered at 350° for 25-30 minutes or till hot and bubbly. This dish be made the night before. After adding the ingredients to the pan, cover with plastic wrap and refrigerate. Before baking, remove the plastic wrap and add the potato chips. Add 10-15 minutes to the baking time. This recipe looks like a winner! I love the addition of potato chips! So simple and delicious!! 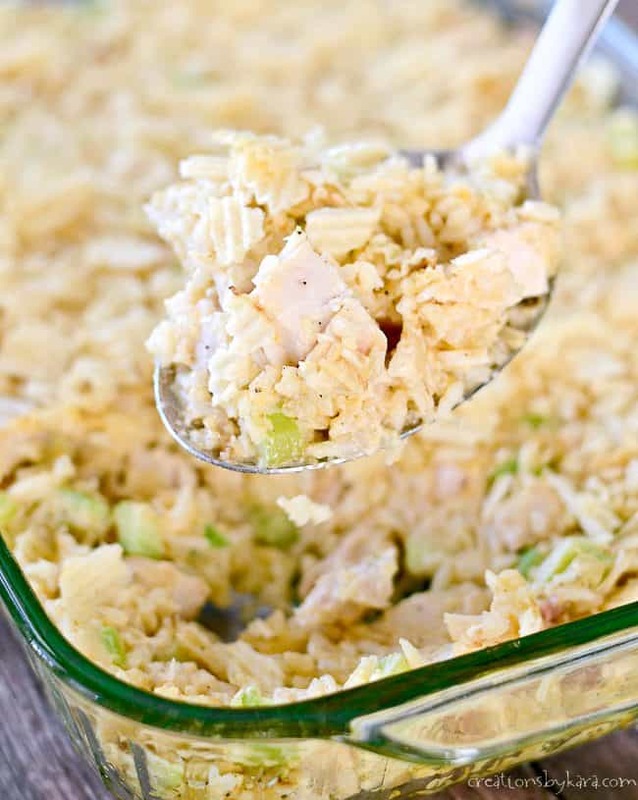 And you can never go wrong with chicken salad! So yummy and such great comfort food – love those potato chips on top! The potato chips on top are brilliant! That alone would have me diving in! The potato chips definitely make it extra yummy! My family loves this recipe!! The creamy and crunchy together is so good!! I made this a couple of days ago and my family ate the whole 9×13 pan even with the celery! Delicious and easy. Yay! I’m so glad that it was a hit with everyone in the family!